Halloween seems the best time of year to point out a lesser known place of interest in West Los Angeles - Pierce Brothers Memorial Park and Mortuary in Westwood. Located off Glendon Avenue, behind the high-rises that front Wilshire Boulevard, this small cemetery is the final resting place of some of the 20th Century's most talented performers and writers. It's the only place you can pay your respects to the man who got no respect, Rodney Dangerfield, whose headstone proclaims "There goes the neighborhood." Of course, this epitaph assumes the neighbors know he's there. Of this, I'm not so sure. Though the celebrities interred within have names that continue to loom large in Hollywood, this place is easily overlooked. Tucked between a ramp for an underground parking garage and an office building, the entrance to Pierce Brothers is about as modest as the simple bronze plates that mark the graves of Truman Capote and Marilyn Monroe. There are, of course, exceptions, like the aforementioned stone of Dangerfield. 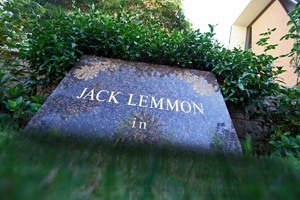 My favorite is the dark humor of Jack Lemmon's marker, pictured above (btw, his grave is within cigar-smoking distance of Walter Matthau, who played opposite Lemmon in "The Odd Couple"). Writers will likely relate to Billy Wilder's self-depricating commentary: "I'm a writer, but then, nobody's perfect." I strolled through with my camera this weekend. The result is a small photo gallery online at www.TJSullivanLA.com. There are also more photo links after the jump. For a more complete list of the celebrities buried at Pierce Brothers, take a look at the more than 200 cited at Find A Grave.